We're trying the Pearl candle by Sage tonight. It's an innocent blend of oak moss, sandalwood and vanilla. The packaging is absolutely stunning and it's burning beautifully - very clean, steady and with a delicate fragrance. "Pearl is a lustrous fragrance that adorns the wearer with an aura of inviting beauty. Inspired by those captivating organic stones that oysters and mollusks have offered humankind since time immemorial, it begins with a delicately fresh, green top note of mousse de chene. The fragrance's full, round base note accord of meditative sandalwood and fresh musks accented with warm vanilla suggests the innocence and spiritual purity that pearls have long represented." This Sage candle is poured in a colored glass container inspired by the gemstone, Pearl and is accented with a matte gold Sage logo. 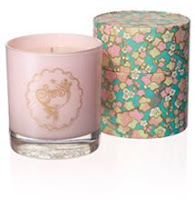 The 3oz candle has a 20 hour burn time and is made with a lead-free wick and dye-free wax. Have you ever tried Sage candles or perfume? If so, please let us know what you think! We love to hear from you.